Glycosuria, or glucose in the urine, is the presence of higher than normal levels of sugar in the urine and may be due to complications with your kidneys or diabetes. 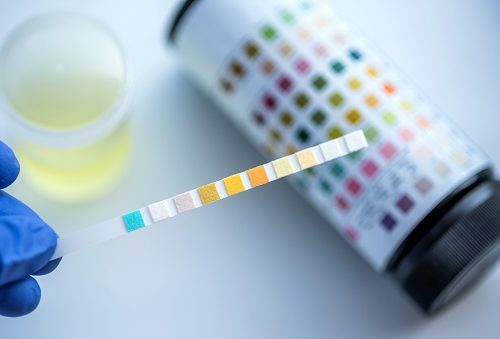 To learn more about this condition, including symptoms, causes, and prevention strategies, as well as what normal and abnormal levels of glucose in the urine are, continue reading. Glycosuria may occur with a host of other symptoms, including excessive hunger, fatigue, infections, frequent urination, irritability, increased thirst, issues with vision, slower healing of wounds, tingling sensation in hands and feet, unexplained weight loss, abdominal pain, and in some cases, high blood sugar levels. Blood glucose is regulated by insulin produced by the pancreas, though in patients with diabetes, the insulin is not produced or processed properly meaning they may need insulin injections to regulate their blood sugar. If left unmanaged, diabetes can cause blood glucose levels to rise and some may enter into the urine. Urine glucose may not always be due to diabetes, and can be a benign symptom that sometimes accompanies pregnancy. Diabetes mellitus: The excess blood glucose levels of people with unmanaged diabetes make it difficult for your kidneys to properly reabsorb the glucose and can cause it to leak into the urine. Hyperthyroidism: Excessive thyroid hormones can cause decreased absorption of glucose that is then passed out of the body through the urine. High sugar diet: Consuming excessive sugar can raise your blood glucose past the level that your kidneys can properly reabsorb, which causes some glucose to be passed into the urine. Benign glycosuria: A rare condition in which the filtering system of the kidneys allows sugar to pass into the urine. It usually has no other symptoms and is inherited. Liver cirrhosis: This disease affects carbohydrate metabolism, resulting in high blood glucose levels that can exceed the kidneys’ capabilities and cause glucose in the urine. Emotion: Some emotions, like fear and anger, can cause the release of adrenaline. Adrenaline encourages the breakdown of sugars to create energy for the fight-or-flight response, causing a temporary spike in blood sugar levels and potentially an increase in urine glucose as well. Urine glucose is measured using a dipstick test, and the following chart explains what the possible readings are and their significance. Glucose in urine: Trace 100mg/dL 5.55 There is a slight presence of glucose in the urine, meaning your blood sugar is high. Some potential complications of sugar in the urine include cardiovascular complications like heart attack, stroke, high cholesterol, and hypertension. Issues with vision, kidney function, nerve damage, as well as sores on the hands and feet may also occur. Glycosuria is diagnosed using a urine dipstick test that will show excessive amounts of glucose within the urine. A more precise urine test can follow to determine the exact amount of glucose within the urine. Treatment for glycosuria depends on what is causing it, and often the management of the underlying condition is enough to treat it. This includes proper management of diabetes and hyperthyroidism. Monitoring your diet and consuming less sugar is one way to help reduce your chances of experiencing glycosuria, as well as leading a healthy and active lifestyle. Regular checkups to monitor your health and any pre-existing conditions may also help prevent glycosuria, in addition to proper management of issues like diabetes and hyperthyroidism. In most cases, there should be no trace of sugar in your urine. A simple urine dipstick test will tell you whether there is glucose in your urine, and in what concentration. Proper management of the root cause, as well as making healthy lifestyle choices that include eating less sugar, may help with the prevention of this condition.